The Breville BJS600XL Fountain Crush is a slow juicer with a vertical design. It runs on a 240 watt motor, which is relatively smaller than the motors of similar juicers; moreover, the motor runs at 80 revolutions per minute. In essence, this means that this juicer produces a softer sound in comparison to other vertical style juicers of 2015. In terms of the external material, unlike most juicers, the Breville BJS600XL Fountain Crush is made out of premium plastic, which may seem counter-intuitive for its pricing. This product is excellent in terms of juicing leafy, green, vegetables; the low motor speed also makes this product an ideal piece of equipment for juicing carrots, cucumbers, tomatoes, and various kinds of peppers. The reverse feature that this machine offers ultimately prevents it from potential congestion. This product is also equipped with a cleaning brush to making cleaning this product as simple as possible, ultimately ensuring better efficiency, performance, and taste. In the context of its competition, the Breville BJS600XL Fountain Crush produces a quieter noise due to its slower motor speed of 80 revolutions per minute. The price is expensive compared to some of its competitors. Yes, you need to do a lot of clicking and dicing before you use the juicer, but the Breville BJS600XL doesn’t clog up or slow down once you add the fruit / veggies. There is no worries with this juicer of overload or lack of performance. Really simple set up, amazing juice quality and the ability to juice ingredients separately. The Breville BJS600XL cleans itself with a bit of water added after you have finished juicing. It slowly cleans itself but do make sure to operate it in both directions for at least two minutes with water running through so that it removes any residual pulp stuck inside. This is all it takes for post-juicing clean-up. Once a week, do remember to dismantle it and scrub or dishwasher clean all parts other than the base. Top quality juice produced from this juicer. It’s just as good as ll the other masticating juicers, as the juice is pretty much what you would get from the top of the range juicers on the market. Foam is limited, and the quality of juice is good enough to store for 48 to 72 hours after. Retains the juice’s nutrients and minerals really well. Strong motor that will last you many years to come. Robust and does the job well. The juicer operates at 80RPM in both direction and juices everything you put in it to a very high quality. That’s why we are giving it full marks. I’m giving this juicer top marks for noise. It’s quiet for a juicer, but it does make a little bit of noise, but nothing major. It juices at slow speeds so noise is at a minimum. 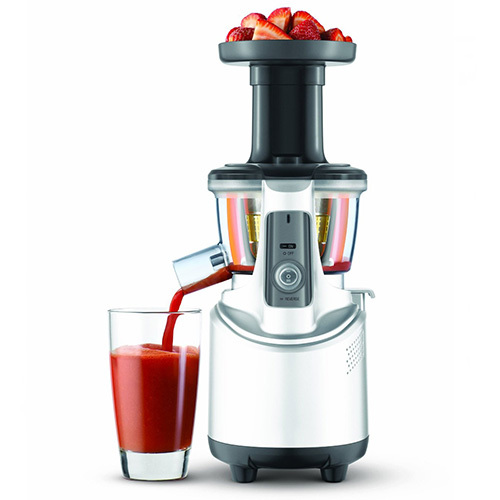 Very good juice yield we found on this juicer, but not as good as it’s direct competitor, the Omega VRT350. Pulp was very dry, but when we put it through again, it extracted about another 50ml of juice. Breville BJS600XL Fountain Crush produces high quality juice that consists of a smooth pulpy texture; it is able to preserve all of the nutrients and fibre from the original source. However, this product performs best when fruits and/or veggies are fed into the machine in a slow, precise manner; this machine will shut down upon overloading. Unlike some of its competitors, Breville BJS600XL Fountain Crush is constructed with pumpkin-orange tinted blades in order to prevent staining. Although the Breville BJS600XL Fountain Crush elicits a healthier lifestyle by producing smooth, high quality juice that elicits a connection between man and nature, the manufacturing for this machine is far from perfect. For those people who want to pay approximately $250 for a plastic juicier, the quality of juice is worth the price, but the mechanical frustrations ultimately override the final product. However, aside from its flaws, the Breville BJS600XL Fountain Crush is great for juicing leafy veggies as long as they are fed in the chute slowly and with precision. Buyers may financially benefit more from a cheaper brand of the same style.